Campus Martius, the Field of Mars, was a big empty plain located between the Capitol and the Tiber, outside the Republican walls of Rome, used especially for military events. At the end of the Republic, this areas was slowly occupied by new constructions, commissioned by protagonists of the History as the General Pompey, the dictator Julius Caesar or the Emperor Augustus. Here for instance Pompey built the first permanent theater of Rome, and here in the 44 BC Julius Caesar found his death. 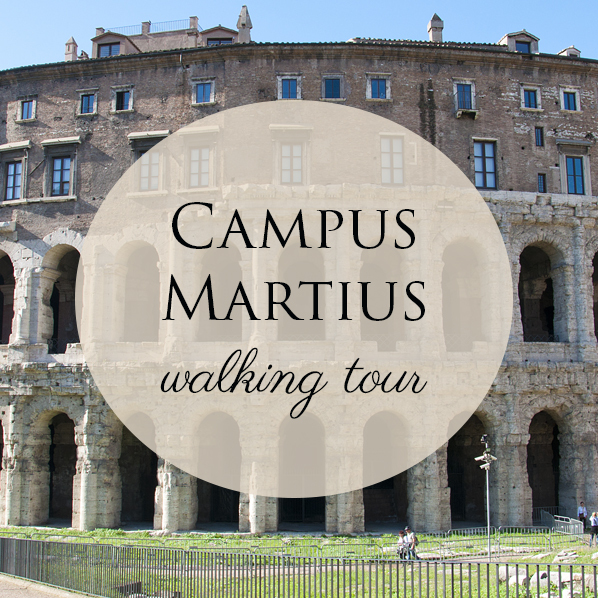 Walking together, we'll discover how the charming alleys of Rome are scattered by remains of the Ancient Rome. You'll see Porticus Octaviae in the Jewish Ghetto, the Shrine of Fortuna at Largo Argentina, the Pantheon. We'll end at the Altar of the Peace, Ara Pacis, consacrated by Augustus in the 9 BC. Meeting point: in front of the "Antico Caffe" Via del Teatro di Marcello, 42. Details will be provided at the moment of the booking. -This tour is outdoor. Tour is provided even in case of light rain since we can use umbrellas and raincoats. In case of a thunderstorm we can choose together to change the itinerary and do a museum/church instead of the Baths. - the center of Rome is paved with cobblestones. Wear comfortably shoes.